The high-water mark of Well-Done! is Jerry Weldon's rousing, up-tempo cover of "Filthy McNasty." Barking out four bars of Horace Silver's angular, no-nonsense line, Weldon sounds as if he can bulldoze anything that gets in his way. The tenor saxophonist's single-mindedness is exhilarating. Subsequent to the entrance of Hammond B-3 organist Kyle Koehler's pumping bass line and drummer Jason Brown's sturdy beat, he takes fifteen smart, frenetic choruses, pushing and pulling phrases into shape so as to make each chorus stand on it own. The rest of the disc shines in a somewhat less ecstatic fashion. Weldon takes his time enunciating most of Tadd Dameron's "On A Misty Night," before executing exuberant bop runs on the bridge. Staying connected to Koehler and Brown rather than simply plowing over them, his solo contains long sweeping lines, blues declarations and a number of economical, down-to-earth passages. An improvisation during his low-key original, "To Marie," is nicely paced, lyrical and expansive. Early on he pauses, lets a few beats go by and then finishes a thought. Weldon eases into the melody of the seldom played "Mona Lisa," waxing wistful for a time, gradually becoming more animated, yet never completely abandoning the ballad feel. 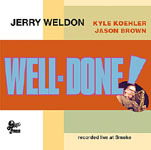 Koehler, the composer of two of the disc's eight tracks, stimulates Weldon with a variety of comping maneuvers and is a versatile, spirited improviser. Building to a few brief climaxes over several choruses, his "State of the Union" solo is remarkably free of clutter and cliche. Koehler doesn't dwell on one thought for too long, and makes a somewhat conventional vocabulary sound fresh and engaging. A strong sense of the music's basic pulse informs everything he plays throughout "The Easy Out," a funky, Latin-tinged tune. Combining intelligent design and intense rhythmic thrust, even during the densest of passages he purposely moves forward without becoming obtuse or too forceful. Track Listing: State of the Union; On A Misty Night; The Easy Out; To Marie; Tangerine; Mona Lisa; Filthy McNasty; Do You Know A Good Thing? Personnel: Jerry Weldon: tenor saxophone; Kyle Koehler: organ; Jason Brown: drums. 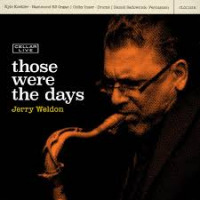 Jerry Weldon CD/LP/Track Review David A. Orthmann Dex Jazz United States Well-Done!